"Hey, did you just get in?" "We'll see you over there." Even my normally quiet husband partakes in this. He likes to mix it up. Sometimes, I learn something new! Which boat are you on? What kind of dinghy is that? 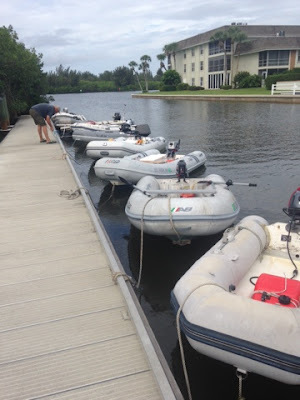 What kind of outboard do you have? Who do you use for weather? How many rolls of toilet paper/beer/diced tomatoes do you have? They have regular grocery stores on the bigger Bahamian islands (tourist areas) that take credit cards, but beer (drink rum, I say!) and paper products are expensive. You can't be picky about your brands and watch those expiration dates. I've seen pallets off Diet Coke piled behind a tiki bar that were 2 years past their expiration date! They won't apologize--they're not embarrassed--just say, "so you want a Coke instead?" Gluten-free products are non-existent and they aren't really up to date on food intolerances (8 bags of gluten-free pasta, 12 bags of gluten-free crackers. Thanks for asking). When you get to the smaller islands, it is even trickier and more expensive (cash is king). A lot of things come in on ships from Florida (knowing when the mail boat comes is the trick to fresh veggies). The locals shop at the same stores, or can point you to their favorites, but they also have a garden at home, and maybe a chicken. There's no Wal-Mart here. You buy bread from the bakery. Cell phone sim cards from the BTC store. Fish from the guy on the dock. (ie. Think scavenger hunt mentioned in Fernandina post--sans car). SO, it's tempting to bring as much as you can with you. 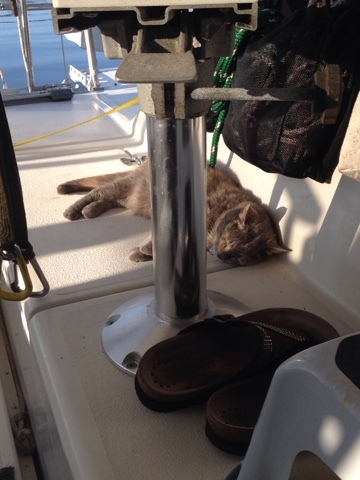 However, we ARE weight limited on a catamaran (try to keep everything balanced fore-aft and side-to-side). Some cruisers bring 3 months worth of their favorite stuff (because they are returning to Florida at the end of the season). I made the decision when we moved on board to have 3-4 weeks (the length of a long passage) of non-perishable food--dried beans and rice, with some canned meat and canned veggies to supplement. When the diet coke and juice run out, we drink water. (Our hope is to continue down the island chain, so the Starbucks coffee probably wouldn't be fresh by the time we would make Grenada anyway). Our other problem is we are "foodies" and the menu changes regularly, so stocking our "favorites" is a moving target. We're both guilty, but the Captain isn't helping: "Stock up on your favorite cracker?" No, I don't like that kind anymore. "Which ones do you want?" I haven't decided. Sigh. White beans & ham in the pressure cooker was just added to the rotation. I'm not sure what was bumped back. Conflicting info from fellow cruisers makes it more challenging. I've been told fresh veggies are hard to find, but our cruising friends that are vegetarian say, "don't worry about it." Breath. As we sit in Vero reading the blogs of fellow cruisers, it's tempting to run to Publix for 6 more cans of diced tomatoes or another 12-pack of TP. Actually, I've been playing this game since we moved on the boat in April and again before we left Brunswick! Friends offered their rental car. Another friend offered a run to Target. Sigh. Should we buy another case of cat food? Should we knock over the bank one more time? Chill, Mom. Perhaps it's time for a nap. Seriousy, the bladder is a good idea. He bought some more Fat Tire but told me I forgot the jam (read the blog, Captain!). Gee, I don't think that was even from your blog, Ellen! Yes, puree for tomato sauce. Add spices for marinara or pizza sauce. It makes it a little easier...then the Muir Glen organic was on sale--"maybe I should buy 12?!" Perhaps I could put a bin in our berth & sleep in a ball.